Comments Off on Welcome to our new server! Technically Motivated has completed its transition to its brand new high-performance server. If you are reading this post, you are now reaching us from our new home. Unfortunately, we do have some bad news to report. In the process of moving over to our new server, our previous email inbox, which is actually hosted separately by our hosting provider, was not transferred. While we have subsequently set up the email address again and you will once again be able to continue to communicate with us via the on-site contact form or directly at webmaster[at]technicallymotivated[dot]com, unfortunately any previous email correspondence from prior to the server move has been lost. We humbly apologise for this inconvenience and will strive to recover whatever we can. Thanks for everyone’s patience during the server move and subsequent downtime; and I hope you will continue to enjoy being a part of Technically Motivated – the Technology Blog for everyone. Our Motivation Is Highlighting Tech Innovation. The wait is nearly over for Windows users. On April 11th, the long-awaited "Creators Update" will launch for Windows 10, bringing with it such useful features as a new "night light" mode that reduces the amount of blue light emitted by your screen so that you an sleep better; a new Windows Defender Security Centre, where users can tweak their security options in one place; and a Game Mode for better performance while gaming among lots of other tweaks. People who do not want to wait for the update to be offered to them through Windows Update can get ahead of the game by downloading Microsoft's upgrade tool to apply the update right now – but a recent report suggests privacy-conscious users may want to hold off from jumping on the bandwagon early. According to an article by Tom's Hardware, which has been backed up by numerous less patient users, Microsoft's Windows 10 Update Assistant may not honour your Privacy Settings if you use it to upgrade to the Creators Update yourself. Instead, the Assistant tries to use default settings – whether or not you choose to upgrade or clean install the new version – meaning that if you changed your privacy settings when you installed Windows 10 and subsequently use the Assistant, you may need to keep a close eye on just what is being set, or you may find Windows suddenly gathering more data about you than you originally intended. Those default settings encourage you to share your location and provide full diagnostic data to Microsoft to fix issues and improve future iterations of Windows 10. The default options also encourage enabling Cortana and receiving targeted ads rather than generic ones. The good news here is that Microsoft is being much more transparent about the data it collects – and when applying the Creators Update, the privacy options offer up clearer descriptions of what they do and the effects enabling or disabling them will have. If you're not looking forward to going back through all those checkboxes, however, Microsoft state that when the upgrade is made available through Windows Update some time during April 11th, existing privacy settings WILL be honoured. We'll know for sure if this is the case soon enough – but as always, it's wise to look before you leap. This article first appeared on Sanitarium.FM under the title Windows 10 Creators Edition Available Now – But Keep An Eye On Your Privacy Settings. Is Pokémon GO About To Expand Its Pokédex? Comments Off on Is Pokémon GO About To Expand Its Pokédex? Pokémon GO has proven popular with nostalgic Android and iPhone users worldwide, and Niantic has shown a strong willingness to maintain that popularity with special events, daily rewards and other updates – but for many players, one thing has held back the game's fun. With the game's Pokédex currently limited only to Pokémon from the original crop of 151 First-Generation species (and no Legendaries or Ditto), many Players have already exhausted all there is to catch. However, there's evidence this is finally about to change. Data miners from The Silph Road, looking at the most recent v0.45.0 release of Pokémon GO on Android, claim to have found references to the names of all 100 Pokémon from the franchise's Second Generation – from Chikorita to Celebi. However, while the Pokémon may be referenced, the game currently lacks models for the additional 100 Pokémon or any data for their movesets, suggesting that a full Johto-flavoured update is still a while away. There may be one Pokémon coming in even sooner though: Ditto. The only non-legendary from the first 151 not available in-game, Ditto has so far been held back from Pokémon GO due its single attack, Transform. After all, coding a Pokémon that can transform into other Pokémon is a tough job. However, v0.45.0 introduces new code for the move, complete with its own in-battle animation, suggesting that Niantic may be planning to introduce Ditto's special move – and possibly Ditto itself – very soon. If so, it would mark the first new move since the game's release. Would the introduction of Johto-era Pokémon to Pokémon GO excite you? And what about Ditto? Sound off in our comments! [Review] MultCloud 2.3.1 – put multiple cloud drives into one service! Comments Off on [Review] MultCloud 2.3.1 – put multiple cloud drives into one service! More and more people are taking their files online and storing them on storage services all across the internet. The reasons they do this are various, but often it's to allow the same file to be gotten at again when on a different computer; to share documents with colleagues or friends; as a backup in case the local computer fails, or just to clear up space on their own computer by using someone else's storage. As the desire for online storage increases, more and more companies are setting up their own storage services offering different amounts of space and features. Some users are taking advantage of this by signing up to multiple services, to increase their storage by combining what's available from all the sites; and sharing their files among them based on which service they feel is most useful for each file. MultCloud is designed with these people in mind by allowing them to connect to several services at once, to remove the need to switch between lots of websites. But is it worth your time? This is an update of a review originally posted on August 26th, 2013 to reflect changes to the service since the original publication. SimCity is finally getting an Offline Mode! Comments Off on SimCity is finally getting an Offline Mode! When Simcity was first released a lot of players asked why it was an online-only game, questioning if this was really best for the play experience. EA answered this by saying that the way the game was designed and programmed meant that it wouldn't work in offline mode. This didn't stop fans asking for an offline mode though, and when modders proved that EA hadn't been truthful with their statement about the game not working offline, they were forced to admit it hadn't been part of the 'vision' for Simcity. Then Maxis said back in October that offline play was being considered. Now it's finally been officially confirmed: Simcity is getting that offline mode that many say should have been there from the beginning. In a post on the Maxis blog general manager Patrick Buechner reveals that Update 10 will bring offline to the game, a free download that will allow players to keep access to their previously downloaded content without the need for a connection. It will allow for play solo in regions or in a new single player mode with save files being stored locally to be loaded up and continued wherever, whenever the player wants. The leaderboards and global market will still be tied to the online play though. “We are in the late phases of wrapping up its development and while we want to get it into your hands as soon as possible, our priority is to make sure that it’s as polished as possible before we release it. So, until then… testing, testing and more testing” Buechner writes in the post. He also promises that a follow-up blog will outline the new update in more detail soon. Let's hope that the priority to polishing this update means that this will be well received and mercifully free of game-breaking bugs unlike a few past updates to Simcity. The blog post mentioned in this article is here. A little while ago here at Technically Motivated, we discussed Aomei Data Backuper, a tool from Aomei Technology – makers of partitioning and data management software that often bears striking similarities to EASEUS and Paragon products, at a fraction of the cost. Aomei Data Backuper is a software that allows users to perform backup and restore operations on files, partitions or whole disks easily. After a quick beta (during which testers were entered into a promotion to win a copy of another software from the company), the product was released as a Freeware, offering easy and comprehensive backup solutions to everybody running Windows XP or 7 at no cost. Aomei Technology this week decided to slightly rename the software, adding an extra P into the name to fix what was seen as a very slight spelling mistake. At the same time, an updated version of the software was announced, expanding support to a wider range of Windows computers. The new Aomei Data Backupper v1.1 (notice the subtle change?) introduces support for Windows 8 computers and the latest Windows Server releases. The software is now offered in two flavours – the full-fat “Backupper”, which supports Windows XP/Vista/7/8 and Server 2003/2008/2011/2012 and for which the download takes 52MB of space; and a lightweight “Backupper For Win7” package, which only supports the most recent Windows releases, Windows 7/8 and Windows Server 2008 R2 or Server 2012; but shrinks the download size to just 14MB. Both versions are functionally equivalent, so the shrunk-down version simply trims the download and installation size for those who have only the most recent Windows editions on their computer. While even the larger package of Aomei Data Backupper only supports Windows XP and upwards, for those who have older Windows releases, Aomei offers a concession to you as well. Also in the v1.1 update is an improved version of the AOMEI Backupper Linux Bootable Disc. Downloadable directly from the product’s download page as well as included with the full installs, the Linux Bootable Disk can be placed on a CD or other bootable media; which can then be inserted into a computer at boot time, allowing Aomei Data Backupper to be used without even touching Windows itself and regardless of what version Windows is on the computer. However, the software can only correctly back up Windows partitions and files, so this option is mostly useful if you have an unsupported version of Windows or can’t boot into Windows for any reason – users of other systems will likely find the capabilities of the Bootable Disk lacking, despite its Linux base. It also comes in handy if you want a portable version of the software to take with you and use on other computers, as the core Aomei Data Backupper software does not have a portable edition. Valve Software, developers of popular gaming client Steam, which allows games to be purchased online (often at seriously low prices) and sync them with your Steam Account so that they update online automatically; and in many cases also allow your games, game saves, achievements and so on to be retrievable on other computers, announced today that due to growing customer demand the company is expanding beyond gaming and making "creativity and productivity software" available through its store. Starting September 5th, Steam will allow users to purchase and download non-gaming software from the Steam Store and link them to their account. Many of the launch titles will take advantage of popular Steamworks features, leading to the exciting prospect that the software, like most Steam games, will automatically update while connected to Steam and may even sync documents or settings wherever you take Steam with you. After the initial launch line-up, the collection of available downloads will be regularly added to with new software on a regular basis. Acknowledgements: As cited inline (Valve Press Release). Dying social network Digg, designed as a site to share news on the internet and allow people to judge its importance to decide which become today's headlines on the site's homepage, was bought over by a new team roughly two months ago for a trivial amount of money. Now the new Digg team have explained their plans for revamping the social network to make it relevant once again, in a blog post at rethinkdigg.com detailing discussions over the last six weeks. One of the major sticking points in the new rethink is to refocus the site around getting to the content people want in the simplest ways possible, dropping anything that isn't constructive to that process. Gizmodo published an article today about one such move, ditching the much-loathed Diggbar; but other plans include dropping Newsrooms; and renaming “Newswire” back to its original name, Upcoming. Perhaps most telling of all though is the new Digg team's assessment as to the role of Digg in the modern internet. Rather than encouraging people to stay on Digg and ignoring every network, the new Digg is being designed to get you to the content you want to read quickly, in the belief that the easier it is to discover things using the network, the more likely you'll come again to find new things (now where have we heard that before…? ); as well as to embrace the networks people have already to judge the relevance of articles. 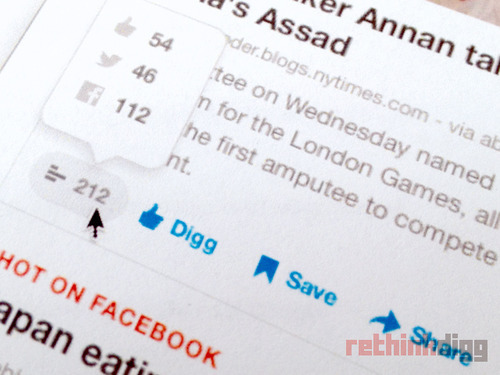 While you can still "Digg" articles on the site itself to increase their score, Digg scores will now also consider how often an article has been shared on Facebook and Twitter to determine an article's overall importance, thereby highlighting the articles most grabbing of people's attention whatever network they use. At launch, v1 will not include a commenting system. When Digg was founded in 2004, it was one of the only places on the web to have a conversation with like-minded people. Today, conversations happen everywhere, and the problem that Digg started to solve in 2004 now has no shortage of solutions. We knew that if we were going to support commenting at launch, we had to do it right, and we knew that we couldn’t do it right in six weeks. In the coming weeks we will conduct a few experiments in commenting that will inform more permanent features. Time will tell if the rethink of Digg by its new team will help make it relevant to the modern world and keep it away from Death's Door. What are your views on its chances?